The Agile 4 Hours of Shanghai event got underway with a 90mins practice session on Thursday afternoon. It was dry but quite cool but it was a good opportunity for me to acclimatise to the 3.4-mile track and the Ligier JS P2 – both of which were new to me. I clocked up some decent mileage and got to know the circuit. I’m lucky that I’m able to learn new tracks pretty quickly, like I did at Daytona, Sebring and Watkins Glen this season. I must have been doing something right as my best lap time was good enough for P1 but of course you never know what the other guys are doing. But it was encouraging start for Paul (Di Resta), who I’d raced with at Sebring and Watkins, and I. That continued into Free Practice 1 on Friday morning when we put another 28-laps on the #22 Ligier with my time good enough for P3 – both Paul and I recording laps in the 58.0 range. Overnight the United lads made a few tweaks here and there and in FP2 on Saturday we recorded the sixth fastest time but we spent the session really learning about the tyre wear looking ahead to the race. I had the chance to challenge for pole but the qualifying session turned out really messy for me. I had a bad opening lap but banked an okay time, pitted for new tyres, and then went purple [fastest time] in Sector 1 but made a mistake in Sector 2 so backed off. On my final lap at the very end of the session, I managed the third fastest time despite the tyres not being at their optimum. 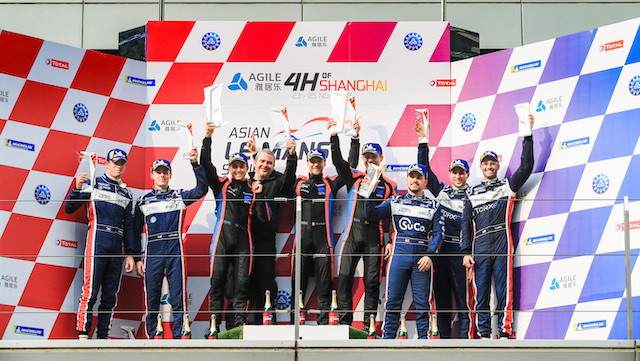 I was nevertheless happy with my performance in what was my first-ever qualifying run for United Autosports and in fact in a sports-prototype in either WEC, ELMS or IMSA. Race day began foggy but thankfully cleared in time for the race to begin, at 9.30am local time, although it was on 16C and pretty humid. The actual start of the race was not what I’d been hoping for. The pole-sitting car, directly in front of me, was quite slow away as the red lights went off. I jinked to the centre of the track and then was on the far left of the track going into the right-hander Turn 1, with the pole-sitter on my right – both of us having been out-dragged by the other front-row starting car. I was half a car in front of the pole-sitter, giving him plenty of room on the inside, but he still slid into me, causing me to half spin and drop to the back of the LMP2 field. I felt I’d been very respectful in the amount of room I’d left for him on the inside but he lost control for whatever reason and collected me as he spun. 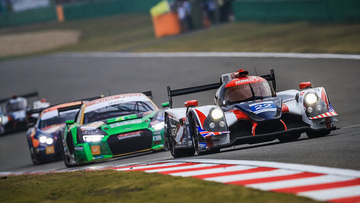 I was in the car for three of the four hours and it wasn’t too bad – I’m used to long stints after this year in ELMS. The JS P2 was physically easier to drive than the later model Ligier JS P217 that I’ve raced up until now this season. There were a couple of caution periods, amounting to almost 30mins as well. I had over 30-laps in the lead before I handed over to Paul with an hour to run. Unfortunately on this occasion, our strategy didn’t pay off and he had to pit from the lead for a splash of fuel with just 10mins remaining. The win was there for us and so both Paul and I felt disappointed standing on the rostrum. That said, we’ve bagged some good points and a couple of our main rivals went away empty handed. I’m excited looking ahead to the next race at Fuji as we showed good pace in China. I’ll be hoping to qualify better and enjoy a cleaner start to the race in Japan! But before that race, I’ll be doing some sight-seeing in China and then in Tokyo.